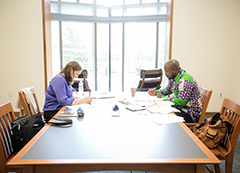 The Library has a number of open seminar rooms, multipurpose rooms and group study rooms that may be used by individuals and groups on a first-come first-served basis when classes or other meetings are not in progress. Due to the level of demand for these rooms, access for all persons needing quiet work space must be maximized. If you are using one of these rooms and there is still seating available, others have the right to use the room at the same time. Monopolizing library space, rooms, seating, study tables or equipment to the exclusion of others is prohibited. Conducting business meetings (virtual, phone, or face to face), tutorial/counseling sessions, and other similar activities is not permitted. Please make / take phone calls in the lobby of the building. For more information, please review the Courtesy and Noise Policy. 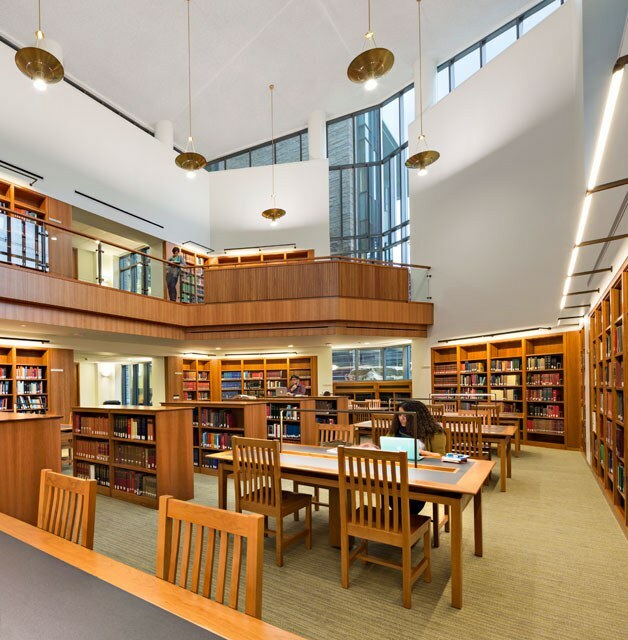 The Reference Reading Room on the lower level, below a beautiful Mezzanine (1090), expansive windows and refurbished light fixtures from Speer Library, is a popular study space with soft and table seating. 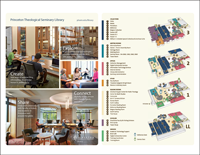 The Alumni Room on the second floor (2036) is another open study space available to PTS graduates and the rest of the Seminary community. 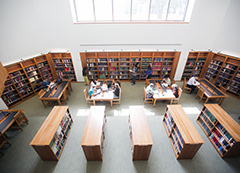 The largest open public space in the building, the South Gallery on the second floor offers a variety of desks and soft seating options. It also affords a spectacular view across Mercer Street to the Seminary's main campus as well as ample window seating, perfect for reading and reflection. The Korean Mission Room, dedicated to the longstanding relationship between our Seminary and the Christians of Korea, is also available for open study and reading. The Women in Ministry Room honors women associated with Princeton Theological Seminary in varied capacities as alumnae, faculty, administrators, trustees. Learn more about the Women in Ministry Initiative. On the first floor, the Brick Café (1020) serves as an informal gathering spot for the PTS community, with windows looking out on Mercer Street. The Concourse on this floor offers ample soft and table seating, while on the lower level, the Iain R. Torrance Atrium (0001) provides additional soft and table seating and is a quiet area for study when not in use for library and other events. For more information about locations in the library, please see Maps and Directions and Library Hours. 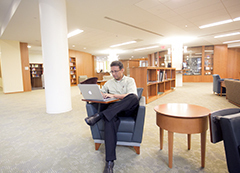 All those who use the library and those who work in it as a place of employment share responsibility for creating and maintaining a healthy and safe environment conducive to the library as a place of welcome, meeting, study, and reflection. As such, we honor these guidelines.